By John BoyleFederal regulators shut down a bear park and fined it $20,000 after it was cited for failing to provide adequate shelter, food and veterinary care for the animals. The Chief Saunooke Bear Park generated multiple protests by People for the Ethical Treatment of Animals, including a visit by former game show host Bob Barker, a PETA activist. PETA has lobbied heavily for the closure of the park, which they say is long overdue because of the inhumane conditions the bears are kept in. The park previously was cited for failing to maintain adequate barriers between visitors and the bears. Last year, PETA posted billboards calling the bear zoos “prisons” and noted in news releases that in two cases visitors had been bitten, including a 9-year-old girl who was feeding a bear cub Lucky Charms cereal and cat food.Comment: I guess bear the park isn't on a Cherokee reservation. If it were, I don't think the feds could intervene. 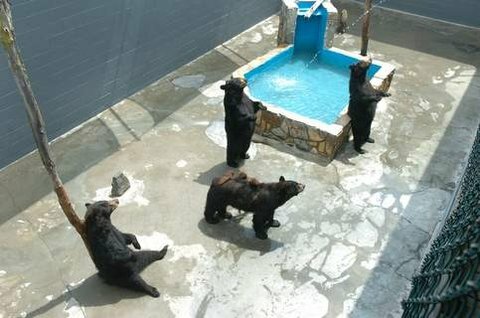 For more on the Cherokee bear parks, see "Children Bitten" on PETA Billboard and Bear Pits = Boarding Schools.